The Tenkarabum Traveler 27 may just be the ideal rod for fishing small streams. It is short enough to use almost anywhere. It is sensitive enough to be fun with 6" brookies, yet can easily handle fish twice that size. People have caught larger fish with its predecessor, the GM Suikei Keiryu Special 27, but the rods are not intended to be big fish rods. They are intended to be small stream rods. Shortly after it was introduced, there had been some confusion about the TenkaraBum Traveler 27. Unlike the 39 and 44, it is not a three position zoom rod. It is a 27, period. I know there are some short zoom rods out there, but I have not been impressed with the ones I have seen. I was more interested in a short, simple rod that does what it does very well without the added complexity and added cost that a zooming design entails. Some people will want to know whether they should buy a TenkaraBum Traveler 27 or a Kurenai HM30R. The two rods do overlap quite a bit in their application and some anglers would be quite happy with either one (and some will want both). There are differences though. The Traveler 27 is right at 9 feet, making it 8 inches shorter than the HM30R. It will be a slightly more convenient in slightly smaller streams. The collapsed length is about 2 1/4" shorter, so it will be slightly easier to pack. The biggest difference is that the HM30 tip sections are almost unbelievably soft. It feels like no other rod you have ever held or cast. It is a tremendous amount of fun with small fish. However, given the extremely fine tip sections, it is not a rod I would use for fishing bead head flies. It just doesn't have the backbone. It is a 7 1/2 penny rod. The TenkaraBum Traveler 27 has soft enough tip sections that you can still cast a size 2.5 line with ease, and a 6" brookie or little wild rainbow will still put a good bend in the rod. However, if you wanted to fish a bead head nymph you could. If your tiny stream happens to have a few 12" fish and fast current, you will not be risking your rod if you happen to hook one. It is a 13 1/2 penny rod. 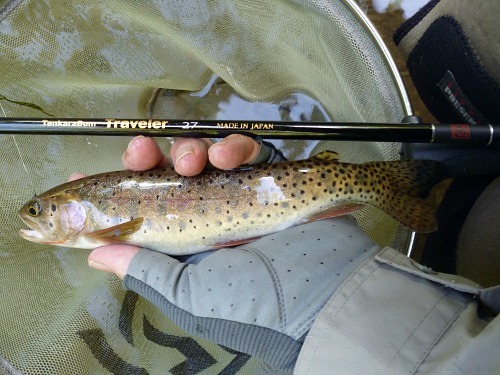 When I think of small streams, for which a 9' rod would be ideal, I do think of little brookie streams in the Appalachians; but I also think of the streams Tom Davis fishes in Idaho, which hold some 14" fish. 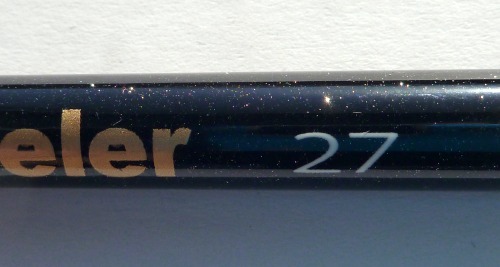 So, the TenkaraBum Traveler 27 is not a "brookie rod." It is a small stream rod. Cutthroat from a Utah stream that in spots you could step over. 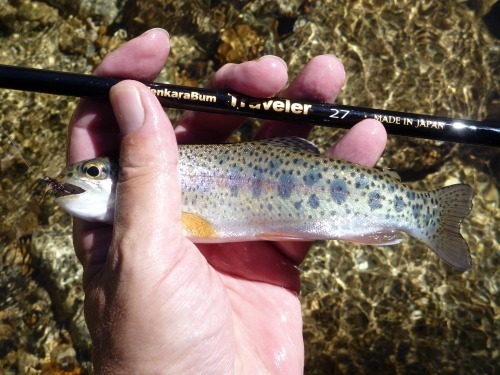 I have to confess that I had thought of the TenkaraBum Traveler 27 (and of the previous GM Suikei Keiryu Special 27 when I first pitched the idea to Suntech) as a small stream trout rod. I realized, just after receiving the following photo, that I had fallen into the trout-centric trap I warn others against. 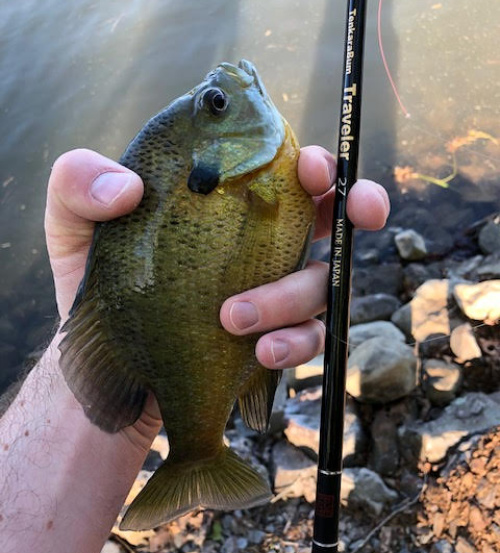 As Dan G wrote when he sent in the photo "It's a great little gill rod." He also said his first cast caught a large mouth bass, which he wasn't targeting, but he said the rod handled it beautifully. Nice to know that if you're fishing for gills and some pesky bass grabs your fly, the rod will survive (as long as the bass is of modest size). Although the TenkaraBum Traveler 27 was born as a Keiryu Special, the revised styling and graphics bring the 27 into the same fold and family as the TenkaraBum 33, 36 and 40 tenkara rods and the TenkaraBum Traveler 39 and 44 keiryu rods. The basic underlying design concept was the same for all of them - to build rods for the way American tenkara anglers fish, from small streams to fair sized rivers, from high gradient headwaters to placid flatland streams, ponds and lakes; from unweighted kebari to dry flies to bead head nymphs; and to build them with all the quality and attention to detail that an established Japanese rod company can provide. Made in Japan. Made for America. 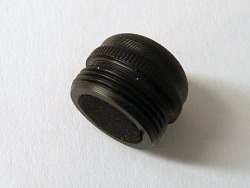 The tip plug is plastic and fits snugly. 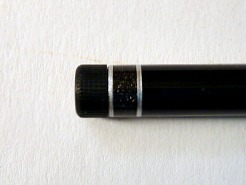 It is shorter and smaller than most tip plugs. If you put it in a secure place, ideally the same pocket every time, and are careful if you have to get other items out of that pocket, there is no reason why it should ever get lost. The grip screw cap is plastic. It is knurled to make it easy to tighten or loosen, and has a foam insert so the rod doesn't clickety clack when it is collapsed. There is no ventilation hole (which exists on longer rods solely to make it easier to extend and collapse the rod by equalizing the air pressure inside and outside the rod, and which is not necessary on short rods). Fully disassemble the rod after fishing, which is the appropriate way to dry the rod thoroughly. The lillian is attached with Suntech's signature swivel, which easily slides through the second section for disassembly. Yes, there are sparkles in the paint on the grip section. No reason why a practical, useful rod has to look utilitarian. The TenkaraBum Traveler 27 is THE small stream rod to own if you can only have one. I've used my Keiryu Special 27 (earlier version of the Traveler 27) at least a dozen times now, and I have enjoyed it so much that I immediately purchased a spare. I don't do that with many rods! It's a great rod for creek fishing where you don't know what you might catch. I've landed bluegills, cichlids, stocker trout, largemouth bass, and catfish on mine, using everything from a Stewart Spider fly to a bead-head nymph. What a delight. I own a Keiryu Special 27 and love it for nymphing tight spots. You will too if you buy one! Yesterday's warm spell here in PA gave me the perfect opportunity to take my Suntech Keiryu Special 27 to my favorite small stream in search of wild trout. What a blast! Caught a bunch. The largest, just over 5", had me giggling out loud, as I could feel the shaking of his head due to the rods sensitivity. I got out with the Traveler 27 this weekend on my neighborhood pond. The rod was an absolute delight! There is no comparison between the quality and action of the Traveler and my other rods.